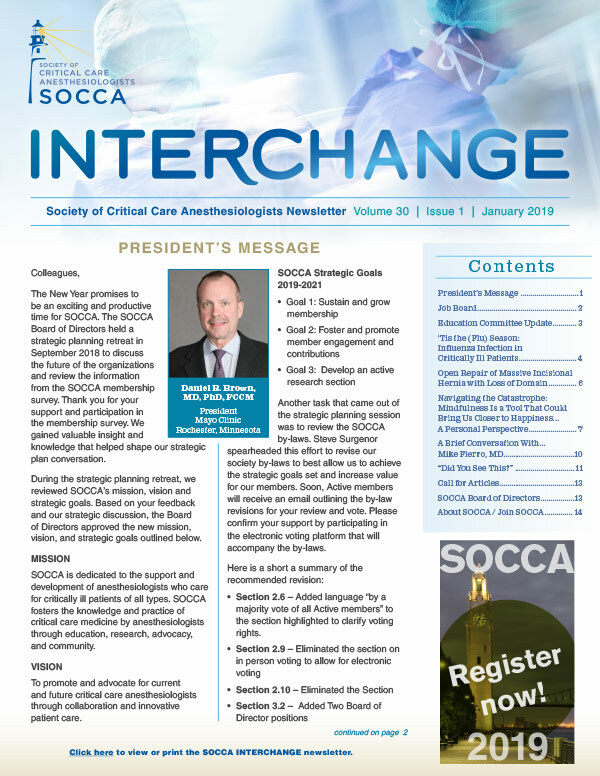 The New Year promises to be an exciting and productive time for SOCCA. The SOCCA Board of Directors held a strategic planning retreat in September 2018 to discuss the future of the organizations and review the information from the SOCCA membership survey. Thank you for your support and participation in the membership survey. We gained valuable insight and knowledge that helped shape our strategic plan conversation. 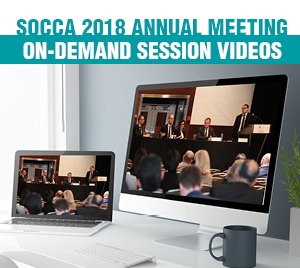 The SOCCA Education Committee is primarily charged with creating educational content for the Annual SOCCA Meeting. To date, this has been our priority focus and we are working hard to develop a unique and challenging annual meeting for 2019. As influenza season begins in the United States, we should reflect on the nature of the virus, pathological presentation and treatment considerations. Multiple types of influenza exist, with type A accounting for the most severe manifestations in humans and responsible for the major pandemic outbreaks, notably in 1918, 1957, 1968, and 2009. Types B and C also infect humans but result in a more typical seasonal infection. Loss of domain is a situation in which the majority of the viscera are outside of the abdominal wall, as may occur with large hernias. In this report, we discuss the surgical approach to repair of the abdominal wall and reduction of the abdominal viscera, and we highlight the significant anesthetic challenges associated with these repairs. 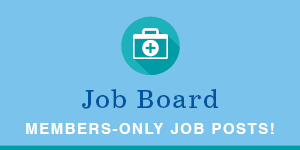 Have you visited SOCCA’s Job Board recently? Recent listings highlight a position with the Oregon Health & Science University of Portland, Oregon. Burnout, as defined by a loss of enthusiasm for one’s work, a decline in work satisfaction, and an increase in emotional detachment and cynicism, is a growing concern in medicine. In Medscape’s National Physician Burnout and Depression Report 2018, a survey of over 15,000 physicians, 42% of all respondents reported feeling burned out, including 48% of intensivists (the highest rate among all specialties). Mike Fierro is an anesthesiologist and critical care medicine physician at the Medical College of Wisconsin. His practice includes general adult anesthesiology and critical care in the Cardiovascular Intensive Care Unit at Froedtert Memorial Lutheran Hospital. He has maintained the SOCCA Twitter account since 2016. If you have an interesting case report, an idea for a pro-con discussion, a review idea, or an opinion on a recently published article, please review the submission guidelines and submit your proposal/article to Vivian Abalama, CAE, IOM at vabalama@iars.org on or before May 24, 2019. If your article is chosen for the newsletter, we will contact you for editing and formatting.